A Critical Stages and White Box Theatre production of A DAY in the DEATH of JOE EGG by Peter Nichols at the Seymour Centre, Sydney. A DAY in the DEATH of JOE EGG was written by Peter Nichols in 1967. It has twice been made into film, the first with Alan bates and Janet Suzman in 1970 (released in 1972). "A WORD FROM THE WRITER. This is an edited extract from Diaries 1969 - 1977 by Peter Nichols, published by Nick Hern Books. July 17th 1969: 'Poor Abo (Abigail), our parcel of damaged goods, lives on, despite repeated promises. The doctor who delivered her has never spoken to us from that day to this. The Euthanasia Bill which I supported, was defeated in the Lords and the Times rejoiced. Our next-door neighbour, Doctor Alan Norton - in his book New Dimensions in Medicine - agrees. In person he told me it would do no more harm than good to alter the vague conditions in which doctors are able to help the dying out of their misery. All right, I argued, but it's in places like Hortham (Abigail's residential hospital) that one looks for courage and mercy from the outside world. What's easier than to sweep those poor idiots under the carpet and forget them? 'May 11th 1971: Notice in the Times column of Births, Marriages and Deaths. Nichols, Abigail, eldest daughter of Peter and Thelma, at Hortham Hospital, Bristol. Funeral Friday, Canford cemetry: Family flowers only. Donations, if required, to the hospital.'" This play has us meet in the first act, the husband and wife, Bri (Jonathan Gavin ) and Shiela (Julia Davis) and they in much detail describe to us the circumstances of their lives, the history and the day to day negotiations with their daughter Joe (Sophie Webb), who suffers from cebebral palsy. We meet this loving couple at a time of great strain, especially for Bri. Such is the stress that in the subsequent act he contemplates the murder of his child and his own disappearance. Whilst the subject matter is one of great substance, and looming propinquity for me, the form, which Peter Nichols uses to involve and communicate, is one that despite the fact the play is some 43 years old, is still of surprising daring and immediately disarming. He smashes the fourth wall and Bri demonstrates his skills as a high school teacher practising his disciplinary routine: "Hands on heads", directly to us, a stand-up comic routine. Later, Mr Nichols has the characters talk to us directly as a double act, stepping in and out of the world of the play and into ours. He has the principal characters deliver intimate and excruciating details in the manner of vaudeville sketches, lectures and gossip. In the second act in a gathering whirl of near farcical action and timing, other characters monolgue to us and partake in the escalating scenes of the unreal stress in and about the world that is Joe Egg's. 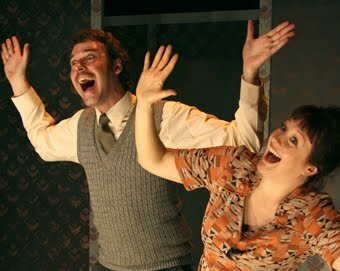 The overbearingly helpful 'liberal-minded' friend, Freddie (Drew Fairley), his wife, Pam (Katrina Retallick) calmly explaining her creepy feeling of disquietitude about being about such 'weirdies'' as the young Joe Egg and the indefatigable Grace, the grandmother (Genevieve Mooy), who knits cardigans and generally clucks disapprovingly of the genetic structures of other families, conveniently deleting references to her own tree!!!! Coming from the personal tragedy and dilemma of the author Peter Nichols this is a significant achievement in the writing. Informative, confrontational, emotional and very very funny. The bravura of the honesty and the clever form structure of the playscript still is mightily impressive. Kim Hardwick has directed the company with great aplomb. The performance I saw was one coming to the end of a longish tour and it sometimes felt a little clockwork. Mr Gavin tended to rush the text and would go for the exaggerated 'boom' for differentiation of effect. One was not really invited on side with the quirks of Bri and so subsequently one did not come to care or identify with and for him and so one was not quite moved. It lacked the warmth and depth, and quandry of the character and failed to convince us to understand Bri's final choices and actions. In contrast, Ms Davis was a securing anchor to the affairs of the play. Her understated and ballasting act to the extremities of Mr Gavin were remarkable indeed and the growing troubles enveloping Shiela were solved with persistent gravity and pertinent pain and understanding. Mr Fairly and Ms Retallick were both robust and three dimensional in awkward roles erring in the satirical arrows of the writing a little to the possibility of caricature. Ms Mooy gave a deliciously wicked and stylish cameo of comic deftness with the right dab of pathos as Grace. Grace, indeed. The design (Alexandra Sommer) was practical in its opaque decorated walls that served the mounting physical farce well. The costumes accurate and telling. The Sound composition (Phillip Scott), especially for the opening of the second act more than a trifle over the top!! Despite a sense of a trifle 'weariness' in the playing' this was a very meaningful re-connection to a seriously important play. Both the subject matter and the form. In the seventies, Mr Nichols with his plays THE NATIONAL HEALTH, FORGET- ME - NOT- LANE and PRIVATES ON PARADE kept his audiences dazzled, amused and thinking. I thoroughly recommend his Diaries and auto-biography, if you love the theatre and all of its going's-on. I know it doesn't matter at this late stage, but I want to explain my over the top Act 2 opening music. Joe Egg is completely inert throughout the play, but as Act 2 unfolds it is explained that she has had a massive fit which has fried her brain even more. Kim and I decided to represent the uncontrolled chaos and destructive power of this major meltdown in music, in contrast to the 'everyday' nature of the opening scenes and the outward inertia of Joe. In fact, the music "speaks" for Joe pretty well throughout the production. It is this massive fit, and the fact that it rules out any future hope of Joe's improvement, that ultimately leads to the breakdown of the parents' relationship at the end of the play. A programme note to this effect would have been useful!